I'll position it into place and solder. 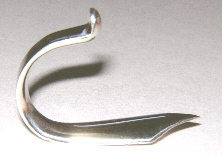 This particular finger hook is identical to the Bach's made from the first horns to the late 1940's. With the finger hook in place, it's time to solder! Here's a close-up look at how I have the part secured for soldering. 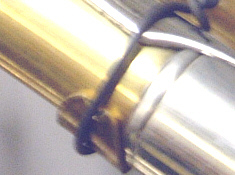 Note the small brass shim placed under the binding wire. 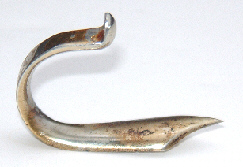 The purpose of this is to keep the wire from damaging the delicate brass of the leadpipe. 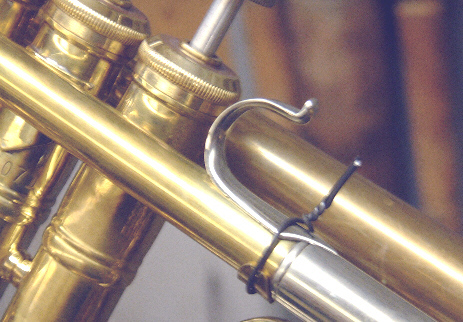 You really wouldn't want to have the wire directly on the leadpipe as it could scratch, or even worse, dent or crimp the tubing! Ready to see the end result of this custom conversion project??? Click "next" and take a look!